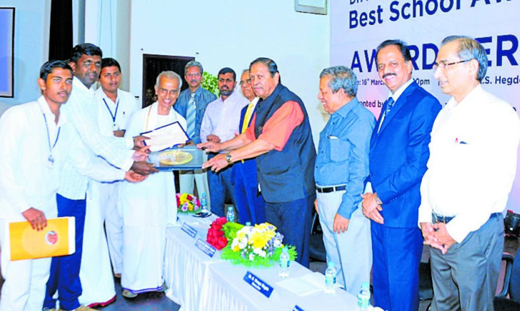 Mangaluru, March 17, 2019: Speaking after presenting the Dr Nitte Shankara Adyanthaya Memorial Best School Awards instituted by the Nitte Education Trust on March 16, Saturday, former Lokayukta Justice N Santosh Hegde lamented that humanitarian values are getting eroded in society. He added that if we fail to give priority to humanitarian values, we cannot have a society with communal harmony. “Students have a responsibility to build the society. There is a need to protect values for communal harmony in society. I have visited 1,048 schools so far to instill values and create awareness among students,” he stated. He said that it is also essential to extend a helping hand when an accident takes place, rather than click photographs and videos of the accident scene. Nitte (Deemed to be) University Chancellor N Vinaya Hegde stressed on the need for mother tongue. “If Kasargod were a part of Dakshina Kannada, the Kannada language would have progressed further. Writers Manjeshwara Govinda Pai and Kayyara Kinhanna Rai have contributed a lot to the growth of the Kannada language,” he pointed out. Selection committee members Kudi Vasanth Shetty, Praveena Kumari and Shankara Narayana were honoured on the occasion. The awardee schools were selected from Dakshina Kannada, Udupi and Kasargod districts. Sri Sathya Sai Lokaseva High School, Alike, won the Best Rural Kannada Medium School and received a cash prize of Rs 15 lakh. Shri Ramakunjeshwara High School, Puttur, won the second prize in the category and received Rs 10 lakh as cash prize. Sri Annapoorneshwari High School, Agalpady, was selected for a special prize of Rs 3 lakh as the best Rural Kannada Medium School in Kasargod district. The awards were instituted in 2016 with the objective of recognising rural Kannada medium schools that excelled in all spheres of education, said Pro Chancellor N Vishal Hegde.